Mezban Persian word literally meaning a host. The word now means ‘community feasting’, a tradition that originated in Chittagong region. It is usually hosted by rich people and the main occasion to organise it is the observance of the 12th day of the lunar month Rabiul Awal, the date of birth and death of hazrat muhammad (Sm). Other occasions include the death anniversary of an individual, the birth of a child, any special achievement by someone, inauguration of a new business, or celebration of the entrance to a new residence.It is not obligatory for the mezban to invite anybody individually. The invitation is open and according to tradition, once the information about organisation of mezban is made public, it becomes a social responsibility for all to join it.Organising a mezban symbolises a high profile of the host. Mezban organisers take pride in the number of people joining the feast, which sometimes may go up to a few thousands. A notable feature of the mezban is its simple menu: just rice and beef curry. For roasted spices dry roast all ingredients separately and grind these to powder together. Marinate the meat with all ingredients, half of roasted spices powder and 2 teaspoon salt except green chillies and sliced onion for 1 hour. Fry the onion it becomes golden brown and add marinated meat. Cook it till it becomes dry; add 8 cups hot water and cook till becomes tender. Add rest of roasted spice powder and green chillies and keep it on low heat for 15 minutes. Enjoy Mezban Beef Curry with plain rice. I tried a few of ur recipe . Taste is fine nd everybody likes it . Now i will mezban beef . I will tale u later on it . Post some special dal recipe . 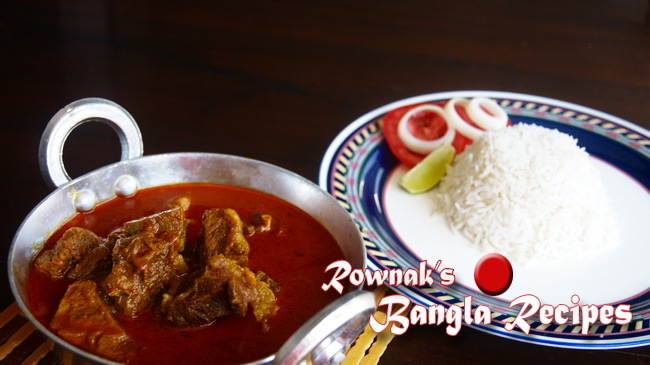 Dear Roqnak Jahan Madam, Chittagong Mezban specialty is : It must have most of the ingredients of a cow of OX. Liver, soft fat, flesh with bone (chest side), soft bone etc. soft fat plays an important role. If you use enough soft fat from the same cow, you can use less cooking oil and you will have real taste of Chittagong Mezbabi Gost. There larger the quantity the taste better. The cow/OX has to be mature. Not calf not old. Cook in a copper cooking pot. Preferably with wood. Thanks a lot. All of your tips are so precious. My mum says that meat tastes better when you cook meat with bone, liver and fat together. And rustic and slow wood flame just increases or makes it heavenly. Thanks again and please share some traditional cooking to enrich this food journey. Dear Rownak, I have been following your blog for quite some time. Could you please post some authentic bangla pork recipes. My family loves all the recipes I try from your website. Thank you so much for the delicious recipes. Can this curry be made with lamb or goat meat? Thank you for posting a delicious recipe.